The Bovini digital multi-scanner provides detection of multiple materials, including wood, metal, and live wiring. Because of its versatility and consistent performance, it's an ideal tool for construction, electricians, contractors, carpenters, masons, plumbers, and others who need reliable detection. Accurate Measurement: Locates center of wood studs up to 3/4-Inch (19 mm) deep, metal studs up to 1 1/5-Inches (30 mm) deep, Wire Warning detection indicates the presence of live wire up to 2". Higher Efficiency: The easy-to-read LCD screen accurately displays what type of stud you are looking for as well as its position and the battery status of the device. Extra Tough: Adopt the recent sensor technology. Precision-designed and incredible durability. It is light weight and has ergonomically designed one-key-operate handle. Certified Safe: Bovini's factory has ISO 9001: 2008 - Quality Management Systems and stud sensor with CE Verified. 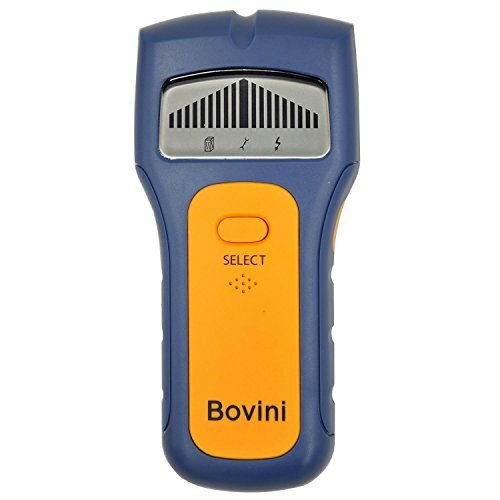 What You Get: Bovini stud finder wood, 9V battery, welcome guide, our worry-free 12-month warranty and lifetime friendly, easy-to-reach customer service. If you have any questions about this product by Bovini, contact us by completing and submitting the form below. If you are looking for a specif part number, please include it with your message.